Creating a Welcome is an idea dreamt up by a few friends who were looking for a way to resist the way our government is dealing with people seeking asylum in Australia. The Asylum Seeker Resource Centre is a community organisation working directly with asylum seekers to provide basic necessities such as food, housing, healthcare and legal assistance. We love it! Creating a Welcome invites creative folk to use their hands, hearts and minds, as well as their skills and convictions, to effect social and political change. 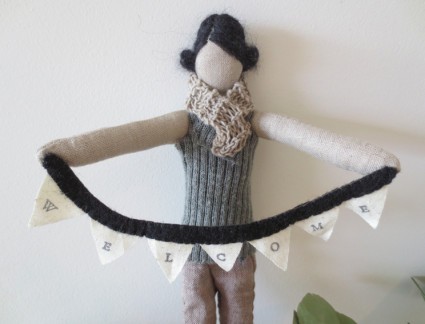 Creating a Welcome invites you to come and visit them at Northern Regards Artisan Market. Have a look at their gorgeous creations (pick them up and give them a cuddle!) and if you see anything you’d like to take home with you, you can consider your purchase a small act of peaceful resistance of your own. This entry was posted in Uncategorized and tagged Artisans, Asylum Seeker Resource Centre, Asylum Seekers, Creating a Welcome, Handmade, local, market, Melbourne, Northcote, Northcote Social Club, Northern Regards Artisan Market, recycled, Refugees, Sustainable, upcycled. Bookmark the permalink.